Please join us for the 30th Annual Walk/Run. 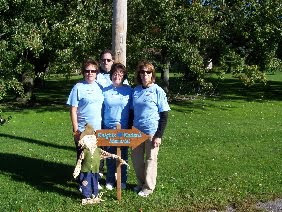 Your $20 registration fee directly benefits Orleans County cancer patients. Pick up your free t-shirt with your paid registration, participate in our 50/50 raffle and Chance Basket Auction and enjoy lunch on us! Every participant has a chance at a door prize. Join our family for what always proves to be a beautiful, beneficial day for all!